Not all spiral galaxies have to be picture-perfect to be striking. Messier 96, also known as NGC 3368, is a case in point: its core is displaced from the centre, its gas and dust are distributed asymmetrically and its spiral arms are ill-defined. 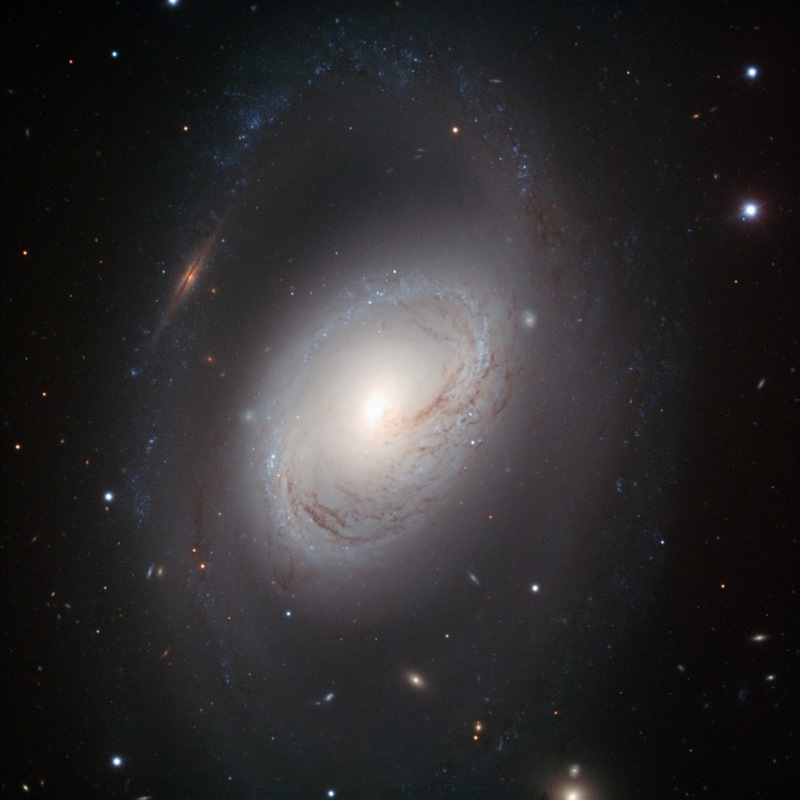 But this portrait, taken with the FORS1 instrument on ESO’s Very Large Telescope, shows that imperfection is beauty in Messier 96. The galaxy's core is compact but glowing, and the dark dust lanes around it move in a delicate swirl towards the nucleus. And the spiral arms, patchy rings of young blue stars, are like necklaces of blue pearls. Messier 96 lies in the constellation of Leo (The Lion). It is the largest galaxy in the Leo I group of galaxies; including its outermost spiral arms, it spans some 100 000 light-years in diameter — about the size of our Milky Way. Its graceful imperfections likely result from the gravitational pull of other members in the group, or are perhaps due to past galactic encounters. A multitude of background galaxies peers through the dusty spiral. Perhaps the most striking of these objects is an edge-on galaxy that — because of a chance alignment — appears to interrupt the outermost spiral arm to the upper left of Messier 96's core. The image was made with data taken at visible and infrared wavelengths through B, V, and I filters.